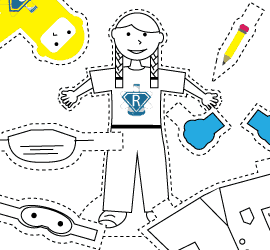 Thanks for being a part of our Flat Rosie Project! We always want to know when Flat Rosie has been up to something fantastic. Whether she visited a University lab, made a potato clock in middle school or investigated exploding volcanoes at home, we would love to see Rosie in action. Tell us a little bit about what Flat Rosie was up to and send us a photo. We will make sure to add it to her lab book! Then, take a moment to check out the research labs she has been visiting in her spare time. Flat Rosie takes to the Road!